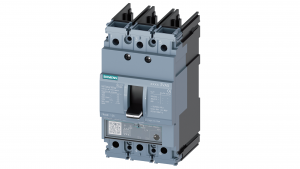 A circuit breaker such as the Siemens new 3VA molded case circuit breaker line is an essential piece of safety equipment that protects critical infrastructure from the harmful effects of short circuits and overloads. MCCBs rank among the most important safety components in low voltage power distribution. 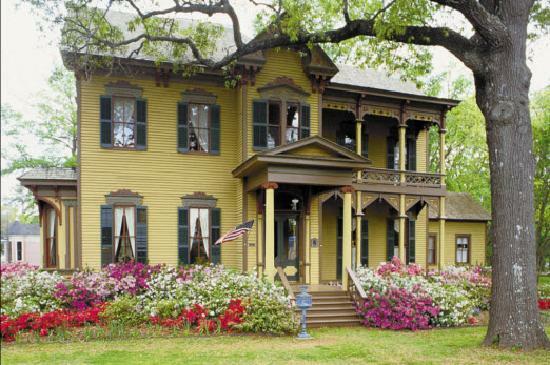 An estimated 30 million MCCBs are installed each year around the globe. Siemens 3VA5 molded case circuit breaker. The new UL-certified series of 3VA molded case circuit breakers from Siemens was designed for low-voltage power distribution in buildings, infrastructure, and industrial applications. But the line was not just designed to protect devices today, but to grow as applications demand and needs change. 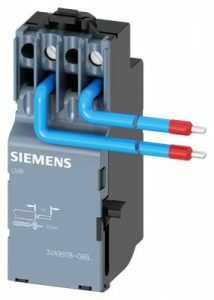 Siemens 3va electrical circuit breaker line is built around a modular concept with a variety of models and accessories. Steiner Electric has placed in inventory Siemens 3VA products that meets the needs of Chicago-area contractors, electricians, MROs, OEM personnel and more. This wide-ranging list of devices include multiple circuit breaker types, auxiliary switches and alarms, a variety of trip options, and the lugs and wire connectors that keep it all together. 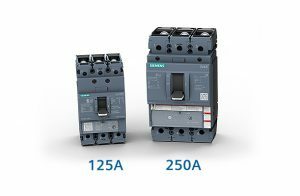 Siemens 3VA5 circuit breakers are available in 125 A and 250 A frames with a variety of options for each. 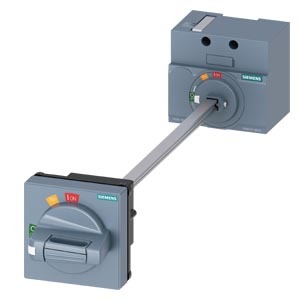 Steiner offers these breaker boxes based on two Siemens 3VA5 frame families. The 125 A frame is a 3-pole breaker box with 25 kA @ 480 V interruption rating that come in models that trip at 15 A, 20 A, 50 A, 100 A, and 125 A. The 250 A frame has a 35kA @480 V interruption rating, and trip circuits are rated at 150 A, 200 A, 225 A, and 250 A. Both devices require minimum space because of their compact design. The footprint for the 3VA5 125 A frame model is 3 in. by 3.8 x 5.5 in. and the footprint for the 250 A frame is 4.13 in. x 4.21 x 7.28 in. For safe operation, the 3VA5 Siemens circuit breakers are based on the concept of thermal magnetic trip units (TMTUs). These TMTUs are two separate tripping mechanisms – thermal and magnetic—that are built into the same device. In a thermal-magnetic circuit breaker, the trip unit includes elements designed to sense the heat resulting from an overload condition and the high current resulting from a short circuit. The thermal safety component works on thermal inverse-time, meaning the higher the current, the faster the breaker trips. The thermal element is a bimetallic strip, which means it has two different metals bonded together that have different thermal expansion characteristics. As that strip warms up, the thermal differences cause the metals to twist and bend and eventually contact a trip bar causing the contacts to spring open. The second safety component is the magnetic trip. The circuit breaker has a trip unit that senses a magnetic field generated by current to detect a short circuit. This type of circuit breaker trips immediately when a short circuit occurs, but delays an appropriate amount of time before tripping in the event of an overload. Steiner offers a wide range of Siemens’ internal accessories that can fit in any of the 3VA products. They can be adapted flexibly, quickly and easily to individual specifications. Color coded for simple installation process, they are designed to always be installed at the correct position in the circuit breaker. A door mounted rotary operator. Just one of the many options available from Steiner. Accessories include multiple operator options, including door mounted rotary operators that come either with illumination, which provides a clear indication of the switching position, and without an illuminating kit. Also available is the Max Flex flange mount operating system that allows the user to locate the circuit breaker almost anywhere within an enclosure. It uses a flexible cable that connects to a breaker operator mechanism and a handle located on the enclosure’s flange. Also available are auxiliary and alarm switches that can be integrated with all sizes of Siemens breakers. The switches snap for easy installation and to swap out as needs change. The Siemens 3VA9, undervoltage release switch. Auxiliary switches can be used to operate indicator lights, relays or other accessories to provide the breaker’s status. Alarm switches indicate that the circuit breaker has tripped due to an overload, short circuit or ground fault. A shunt trip will trip a breaker remotely, and an under voltage trip release will activate when voltage shuts off or dips. So, when looking to install new or replacement breakers, consider the 3VA5 products that offer myriad design possibilities.